The Treaty of Versailles required the closing of all military academies within the German Empire. The "Hauptkadettenanstalt" was closed in March 1920. Thereafter it became the "Staatliche Bildungsanstalt" (State Institute for Education). Under this new guise, and despite effords to liberalize the curriculum, it became a para military institution, and home to right wing cells. Many students were attracted quite early to the Nazi party. In 1933, the academy was taken over by the "SS Leibstandarte Adolf Hitler" - Hitlers bodyguard. The compound was then expanded to the southern area of the grounds. All buildings here date from the Nazi era. During the war, the facilities suffered heavy damage. The compound was taken over by United States forces in July 1945. On the Fourth of July, it was the site of a ceremony marking the official takeover of the American sector from th Soviets. Both Soviet and American forces participated, as the American and Soviet flag flew above a portico still bearing the inscription: Leibstandarte Adolf Hitler. 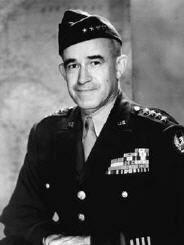 General Omar Nelson Bradley (February 12, 1893 – April 8, 1981) took command of the American Sector of Berlin from the Soviets on July 4, 1945. 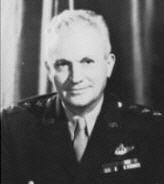 Andrews Barracks was named after Lieutenant General Frank Maxwell Andrews, who was in charge to build up of U.S. forces in England. He was killed in an air accident over Iceland in 1943. 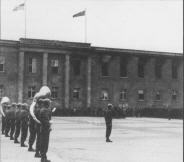 The german government build a new military academy: the Prussian Cadet Academy (Preussische Hauptkadettenanstalt). The cornerstone for the new academy was laid on September 1, 1873. The main entrance was projected to the south off Altdorfer Strasse. Original construction consisted of the administration building that also housed residential space for the top brass and two chapels – Roman Catholic and protestant. A dome was added to the administration building. Other buildings were also constructed: barracks, a mess hall, stables, a gymnasium, shooting ranges and a military hospital. There was also a drill field that the Americans would use for sports during the allied occupation. Due to the contract of Versailles, in May 1920, much of the installation was designated a city-controlled high school (Gymnasium) and named the Hans Richter Oberschule. Thus the Germans would be diverted from their Prussian love for military pursuits into more mundane civil avocations, so went the reasoning. Remaining portions of the installation housed city police units. The former academy also became a hotbed for rightwing political activities. The school was short-lived. By 1933, the SA and the SS had moved in. By 1934, the whole compound was taken over by the “Leibstandarte Adolph Hitler”. 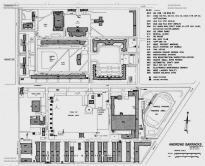 Between 1934 and 1938 all buildings on the compound were either modernized or replaced. It was during this period that two original block buildings were razed and replaced by up-to-date modern barracks. A new main gate on Finckensteinallee was opened to provide access to the newly installed Strassenbahn tracks located there. Larger guardhouses were also constructed. The pool was constructed for the 1936 olympic games. It is a world quality facility with a capacity of 1.2 million gallons, measuring 50 meters long by 25 meters wide and ranging from eight to 15 feet deep. It also sports a 50-meter track and a 10-meter diving platform. 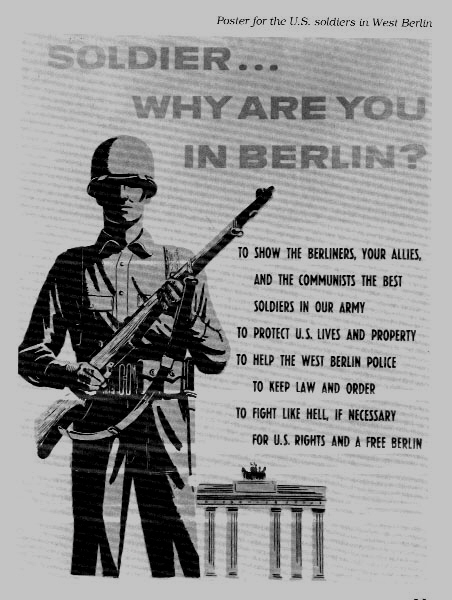 In May 1945, having fought the Battle of Berlin, Soviet troops occupied the compound. 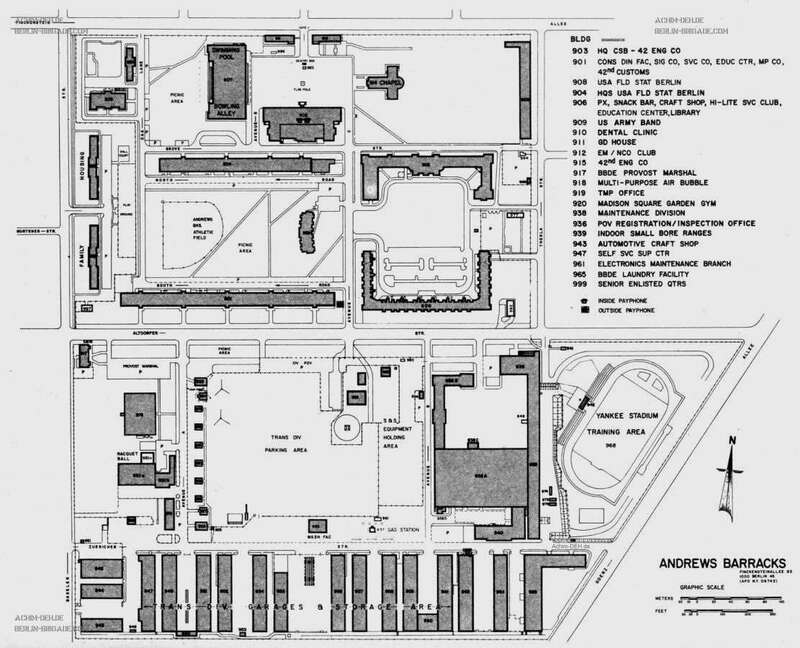 The old academy barracks would be renamed Andrews Barracks. Construction and restoration continued apace during the occupation. The new chapel was erected in 1953. The old domed headquarters that housed two cadet chapels in the early days was demolished due to war damage and deterioration. The west wing of the old crew building was rebuilt. Other buildings of the original installation, damaged beyond reclamation, were also razed. Of the original construction, only the northeast barracks adjacent to Thekla Strasse still stands. 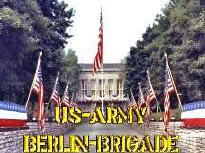 Andrews Barracks was the home for U.S. Army Security Forces in Berlin, it also housed the military police of Berlin Command, the 298th Army Band, the 20th (later the 42nd) Engineer Company. Also there was located the Transportation Motor Pool with the Bus Unit, the Cargo Unit and the Driving Testing School, the Laundry with own heating plant and water treatment plant with deep well pumps, the Maintenace Division with Office Machine Repair Shop, Tank Repair Shop and Amor Repair Shop with a branch for gunmetal-finishing. After the departure of the Americans in 1994, control of the compound returned to the German state. The portion of the compound facing on Finckensteinallee houses the division of the German National Archives that is charged with preservation of the documents of the now-defunct German Democratic Republic. Views today: 18 - total: 1566.